As you get older, men and women begin to experience loose skin, especially around their face, neck, and chest. They may be experiencing wrinkles and fine lines, sagging skin around the chin, and droopy eyebrows. Some turn to skin care products and facial products that promise a youthful appearance while others believe their only solution for that skin tight feeling is to undergo intense plastic surgery. This involves an extensive recovery time, possible complications and negative side effects in which you must take off work and hinders your daily activities. However, there is a method that produces lasting results without going under the knife. This procedure is called Ultherapy. What Is Ultherapy & How Does It Work? Ultherapy® is a non-surgical ultrasound treatment that helps turn back the clock on your skin. It is a completely safe alternative to a surgical facelift that uses the body’s own regenerative response to create collagen to gently and gradually lift and tighten skin on problem areas such as the eyebrows, chin, neck, and chest. As a matter of fact, Ultherapy is the ONLY treatment that forms collagen to lift and tighten you skin. Ultherapy can also be safely used on other parts of the body to lift saggy skin such as the knees and the tummy area. 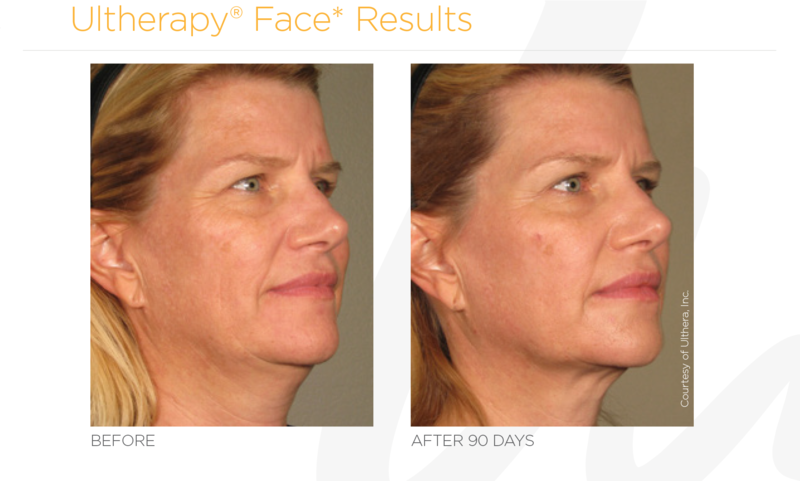 Ultherapy® is an excellent alternative to plastic surgery. It produces similar results without the intensity of a full-blown, lengthy and dangerous operation. There is no down time, no ugly scars, and no effect on your daily activities following the procedure. It is cleared by the FDA and proven to be safe. Ultherapy is the perfect alternative for those who do not want to go through complicated surgery or painful injections but want similar youthful results. A typical candidate for Ultherapy® has mild to moderate skin laxity that is beginning to look and feel a bit less firm. This may include loose skin on the neck, sagging skin under the chin, droopy eyelids, and various fine lines and wrinkles on the face, neck, chest and forehead. However, the best way to determine if Ultherapy® is right for you would be to schedule a consultation at Syracuse Medical & Aesthetics where this therapy is performed. Treatment Time: Ultherapy treatment length is usually 60-90 minutes for a neck and face treatment. Chest procedures will typically take only 30 minutes. Discomfort Level: Mild to moderate but very tolerable. 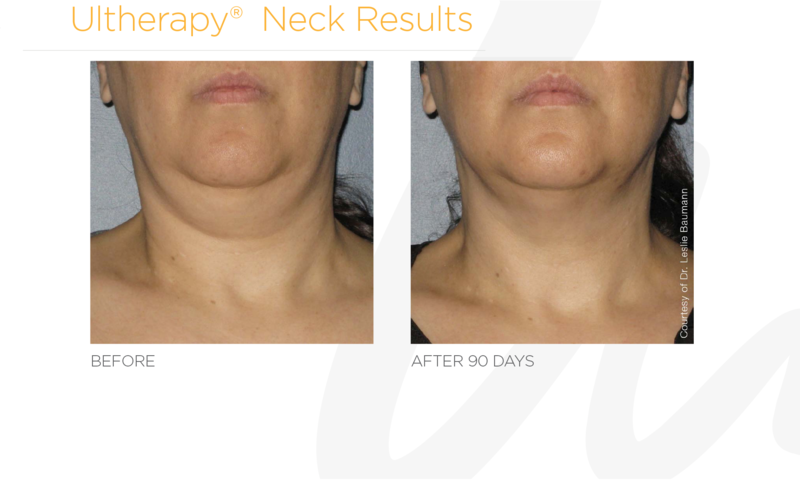 Ultherapy is the only FDA certified non-surgical treatment that provides effective results that last two to four times longer than any other non-surgical procedure. After the procedure, results are typically seen within the first month. Results continue to improve until they fully take effect in about six months. In less than a year, you can have the skin tightening results that last without going under the knife. As for recovery time, there is none. Following the procedure, you can resume your daily activities as normal. No post-treatment downtime at all. If you want to look and feel younger without the costly, painful, dangerous and time-consuming plastic surgery, Ultherapy is the perfect solution for you. Our team of skilled professionals at Syracuse Medical & Aesthetics use cutting-edge technology to offer the Syracuse area a wide range of health and wellness services catered to each individual. 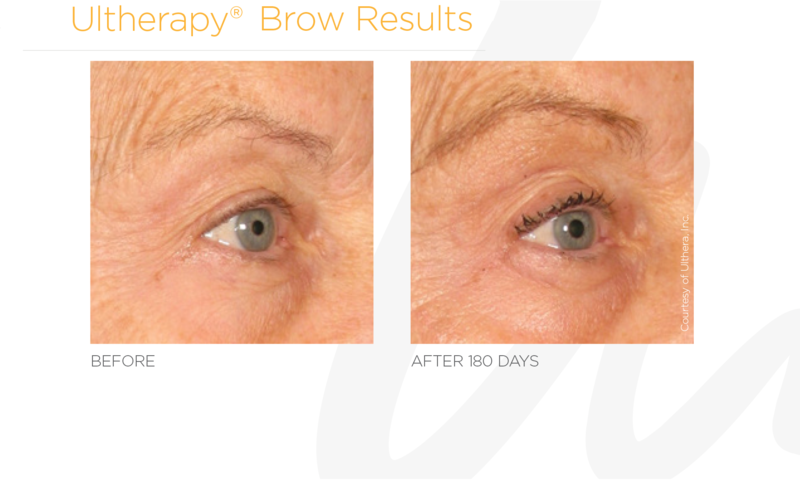 From a brow lift to a neck lift, our licensed esthetician will help you determine which Ultherapy program is best for you to reach your skin care goals and desires. Syracuse Medical and Aesthetics will get you feeling radiant and youthful in no time. To get started, call our office today or fill out our below online form to schedule a free consultation today!